First light: 16 May 2002. Participating organisations: The instrument was funded by PPARC and designed and built by a consortium involving the Universities of Sheffield, Southampton and the UKATC, Edinburgh. Description: ULTRACAM is a high-speed, three-colour CCD camera designed to provide imaging photometry at high temporal resolutions. The instrument is highly portable and will be used at a number of large telescopes around the world. 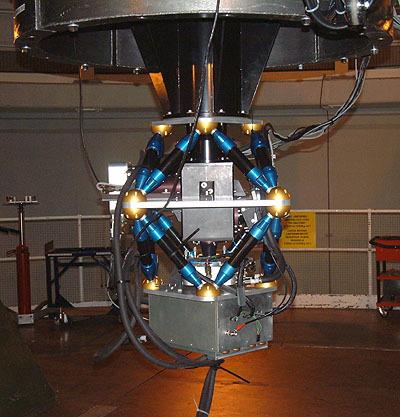 On the WHT, ULTRACAM mounts at the Cassegrain focus and provides a 5 arcminute field on its three 1024×1024 CCDs (i.e. 0.3 arcsec/pixel). Incident light is first collimated and then split into three different beams using a pair of dichroic beamsplitters. One beam is dedicated to the SDSS u' filter, another to the SDSS g' filter and the third to the SDSS r'/i'/z' filters, although it is possible to use different filters if required. By careful selection of glasses and coatings on the optics and chips, we have achieved an instrumental throughput of approximately 50% in the green and red arms of ULTRACAM and 30% in the blue arm. Combined with the fact that ULTRACAM mounts at Cassegrain, and hence telescope losses are minimal, we obtain a count rate of approximately 2,000 per second for a V=18 magnitude star in the V-band.